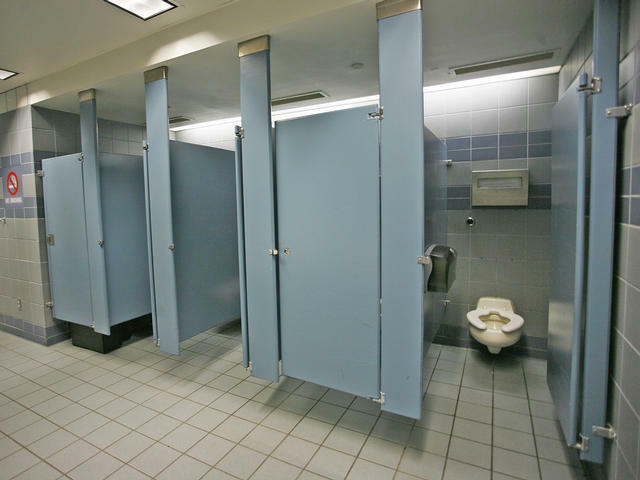 It can make an easygoing parent un-nerved… and a germaphobe parent down right frightened – the public restroom. I am a recovering germaphobe. My second child has helped me to move past some of my old anxieties. But put me in a public bathroom with the kids and I start getting nervous. So yesterday we were on the road and made a pit stop at Wendy’s. Brogan had to go potty, and so off we went. Now Brogan is in an “independence” phase, which means he wants to do everything (he wants to do) on his own. Using public restrooms is one of those new solo acts. So when we walk into the bathroom, he immediately bolts to the first stall and locks himself in. “I can do it by-my-self!” Ok, I think. He’s a big boy. This is not the first time. Let’s see how this goes. Waiting… waiting… waiting… “Brogan, are you done?” “Not yet!” he hollers. Curious (because I’m not hearing the typical noises and it’s taken a little too long), I peak through the crack of the door. He’s got toilet paper. Well, this wasn’t a job that required toilet paper, but whatevs. I keep watching. He places the toilet paper in the toilet, looks at it, and then decides he needs to take it out. He begins reaching his hand into the toilet… “BROGAN!!!! NO!! WHAT IN THE WORLD??!! DO NOT STICK YOUR HAND IN THE TOILET!! BROGAN!!! !” Breath, breath. I’m not quite sure if his fingers actually touched the water, but they definitely went into the bowl. Just awful. So I’m now trying to coax him out of the stall, but he’s perfectly content. He ain’t coming out. I’m weighing my options… which unfortunately are limited to me getting on the floor and crawling under the door. Well Brogan must have read my mind, because all the sudden he decides he’s ready to come out, but rather than unlatch the door, he puts all four on the floor and starts to crawl out. “BROGAN!!! GET OFF OF THE FLOOR RIGHT NOW!! THAT IS DISGUSTING!! YOU DO NOT PUT YOUR HANDS ON A BATHROOM FLOOR!!! The kid is trying to make me gray. He finally made it out (through the door, not under it). I scooped him up, washed his hands twice and we quickly left. Not quite sure where my germaphobia stands right now… sometimes these type of episodes help me toward recovery, realizing that despite my best efforts, I can’t keep them from all filth. And sometimes when it’s really bad, it makes me want to curl up in a corner or spray them down with a fire hose. Perhaps this time it’s a little bit of both. This entry was posted in Kids and tagged Anxiety, Bathroom stall, Germaphobia, Kids, Parenting, Public restrooms, Public toilet, Toilet by biscuitsncrazy. Bookmark the permalink. Dear God! I would have fainted. I am the worse germaphob.